Chunju Han-il Kwan has been open for many years and is known for a solid Korean menu. They have a number of stews meant for two or more as well as individual dishes. 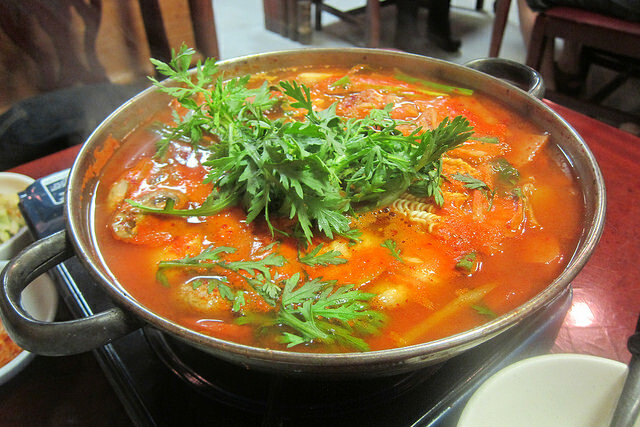 Budae jiggae (also spelled jjigae, jigae) is also called army stew, military stew and affectionately “booty” jiggae. Jiggae means stew and I love Korean stews. Everything from black goat** to crab jiggaes get my attention. 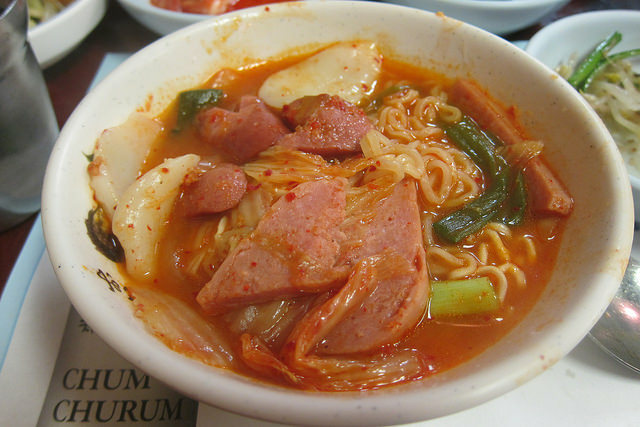 But the fun one to eat with friends is the budae jiggae which came out of the tradition of stewing spam, hot dogs, sausage, instant noodles and more. These rations were given to the Koreans by American soldiers and it’s probably one of the best known fusion dishes in Korea. When my friend mentioned wanting to try a Korean restaurant with lots of banchan, I knew we had to go to Chunju. 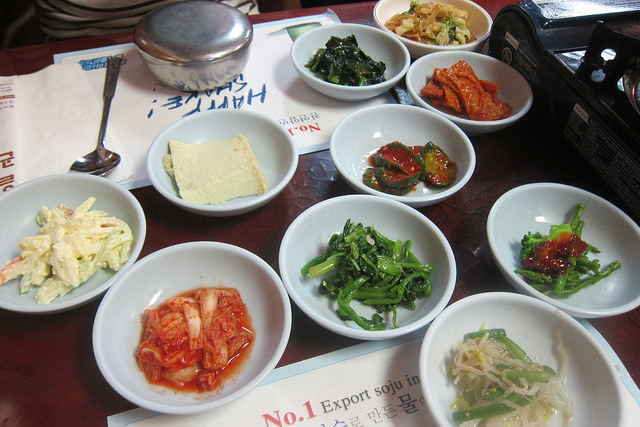 They serve a nice assortment of kimchi, pickles, bean srouts, greens, potato salad and more. We had so much to eat, we never asked for refills. When your stew is served, it’s pretty much ready to eat even if the instant ramen is still in brick form. Our server scolded in a good-natured way it’d get mushy if we left it in too long. We didn’t think it was too spicy but the heat builds up a bit. I was glad for my bowl of purple rice. Next time I’ll try the seafood jiggae. ** Chin Go Gae for black goat stew is now sadly closed. I am looking for another restaurant to try one of my favorite stews.